If you want to “wow!” your guests at a festival, wedding, concert, or sporting event, a continuous flow confetti cannon from Flutter FETTI will do the trick. Our confetti cannons shoot our fluttering FETTI high in the sky, creating a beautiful effect that will amaze and astound everyone in attendance. Height is never an issue as our confetti cannons can be used in venues with ceilings as low as 9 feet to outdoor venues with no ceiling. Depending on your confetti cannon selection, the confetti will fly, float, and flutter from 15 feet to an astounding 100 feet into the air! We carry confetti blower machines that are ideal for small to medium-sized venues (our “baby” gerb launcher and continuous flow red blower confetti launcher), as well as models that are designed for large celebrations (our 3 inch and 6 inch continuous flow launchers). Our smaller confetti cannons shoot our fluttering FETTI 40 feet high in the air, and our more powerful models can shoot FETTI up to 75-100 feet. Our 3” and 6” Continuous Flow blowers have 2 horns. The top horn blows the Flutter FETTI products and the bottom horn just blows the liquid siphon Co2 air which turbo charges the confetti to go higher and spread out more in the air. We now offer a DMX compatible system to use with our all our Gerb launchers. Whether you work in the event industry and can see yourself using one of these stunning pieces of equipment on a regular basis, or you’re throwing a one-time event, you’re guaranteed to get your money’s worth. Each confetti blower machine in our inventory is available for both purchase and rental, so you can choose the best option for your needs. Money Saving Bonus: Love your confetti cannon rental so much that you want to buy it? Flutter FETTI gives you a fantastic purchase incentive! You can apply your recent rental fee toward your purchase, acting as an immediate discount on the full purchase price of the equipment. Browse through our assortment of confetti blower machines today, and don’t forget to check out our selection of colorful bulk confetti Corkscrews or die cut products that you can use to fill your machine. If you have any questions about our products or our wholesale prices, feel free to reach out. We’re always happy to help! Ready to make a HUGE impact? Expert advice is only a phone call or e-mail away! 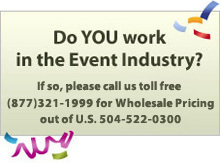 Contact our Confettiologists Toll Free at 877-321-1999 (outside of the U.S. at 504-522-0300) or send us an e-mail. Our dedicated Team is here to make every event FETTI-tastic!